Yesterday I accidently put caffeinated coffee in my coffee press, I was so tired I didn't even notice, until the jolt of caffeine hit me. I usually only drink decaf, so it was very shocking! I was buzzing around cleaning my house & decided to use that extra jitteryness (is that even a word?) to create some new art cards. 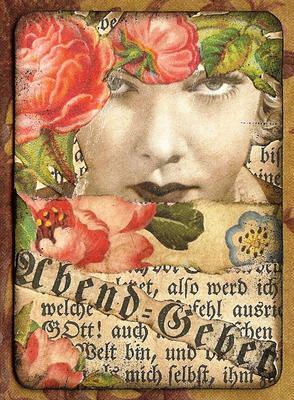 I love the look of this art card, so I made 3 more similar ones, they turned out to my satisfaction, which is unusual, as I am never quite satisfied with my art cards. So now, I have some new art to put on ebay when I reopen the store....I think I will make that a goal, to create 20 of them to list, when I reopen the store by the end of August or beginning of September. Who knew Caffeine was a muse? Great card!I love all the wonderful art on your blog. The black background sets it off PERFECTLY. hey, that is a beautiful card! you should list more often..
did my set arrive to you yet? hey .. i totally feel you about coffee .. i dont drink coffee normally, but when i do, oh boy! i love those cards you make. i'm looking forward to your ebay sales. As someone who drinks a LOT of coffee, I totally related! Glad I found the blog. ...And I wish caffeine worked that well for me. I love the art cards you use... gives life to a post. I love all your cards. They're so beautiful. How do you go about creating them? I love this page, write more! Use your coffee for times that you need it. It's like coccaine. At first it's a big rush. It sends you into a creative frenzy. You do things like you've never done before! After a few months you take more and more......until you become numb to 5 cups/day. Keep the coffee in your pocket for times when you'll need it.